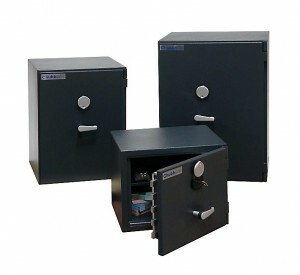 Chubbsafes recently launched an updated version of their Cobra G1 safe. 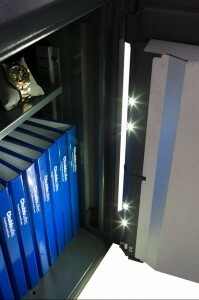 Now known as the Cobra Pro, the electronic version of the safe has been upgraded to include a convenient LED light. The Cobra Pro range has been designed to provide a robust security solution for the home or office. The walls have been engineered to be thinner than in other safes, maximizing the internal storage capacity without impinging on burglar resistance. Tested and certified by the experts at the ECB-S, Cobra Pro safes are rated as Grade I under the EN 1143-1 Eurograde system. They have been subjected to attack by a variety of powerful tools, including powerful thermal and electrical equipment. Key lock models are fitted with an EN 1300 Class A lock. Electronic lock models are fitted with an even more secure Class B lock capable of supporting up to 10 user codes. This electronic lock also features a time delay feature for increased security, allowing a window of up to 99 minutes between the lock being operated and the door of the safe opening. As mentioned above, electronic models are fitted with an LED light which conveniently illuminates the contents of the safe when the door is opened, making it easy to find smaller items. Finished with a stylish but understated black paint powder coat, all Chubbsafes Cobra Pro models feature an ergonomic, soft touch door handle for easy opening. The interior of the safe features a ladder racking system so that a shelf (1 included as standard) can be easily positioned at various heights. Three sizes are available. Sizes 2 and 3 will easily accommodate most typical-sized binders and are particularly ideal for a small office looking to secure a combination of paperwork, cash and/or valuables.